After a long summer, which is still warming Marbella, it’s time to update our homes with the latest trends in interior design and decoration for this autumn. And what could be easier than bringing in the season’s new textiles?. In autumn we usually turn to warm fabrics in neutral colours which inspire feelings of calm and cosiness, but this year we were surprised by the huge doses of cheerful colour offered by the major fabric design houses: flowers, birds, jungle… as interior decorators, we are delighted to have so many options to fill your home with light and happiness! 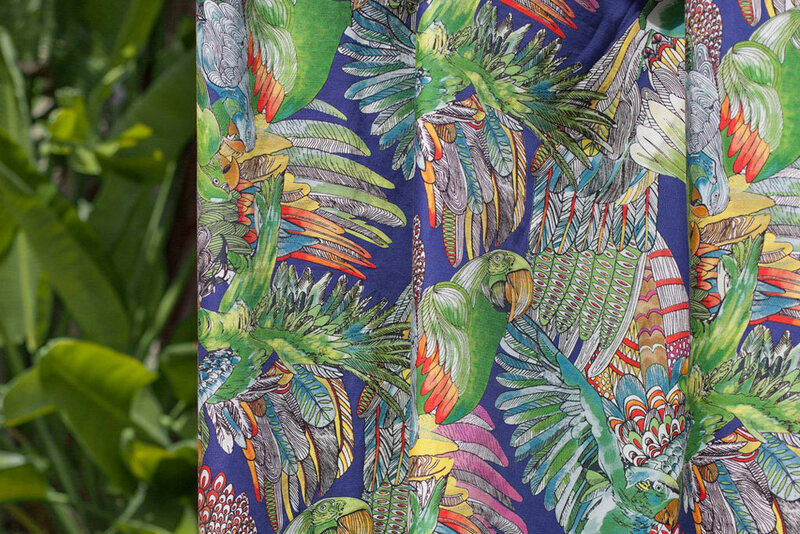 We begin with the company Osborne & Little, who offer the Cubana collection by Matthew Williamson, inspired by Cuba’s most glamorous era – exciting and vibrant! Another firm taking its inspiration from the earth is DRT, with a sense of connection to nature. Essential for luxury décor! The latest designs by Casamance also show us that this year, nature is an inseparable part of interior design. We’ll be seeing it in all the chicest interiors! Those neutral-coloured fabrics that transmit serenity are also closely linked to nature, especially in the mock-croc velvets brought to us by the company Jab. Based on the wildest nature, the fashion designer Roberto Cavalli offers his take on animal print, in silk… savage beauty! Progress is all around, and this includes textiles. Digital prints are applied to velvets and artificial silks by the company Zinc, ideal fabrics for upholstering a sofa and adding a touch of glamour with their new designs inspired by evening parties; here, the mix of shine and matte makes for an exquisite contrast. You can find all of this and much more in any of our 3 shops, where we will be delighted to welcome you and assist you with everything relating to the decoration of your home.